Twelve page pull out. 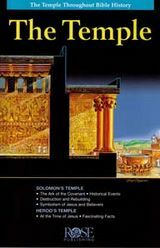 Solomon’s Temple with information about the Ark of the Covenant, historical events, the destruction and rebuilding, and the symbolism of Jesus and believers. Also includes Herod’s Temple at the time of Jesus with some fascinating facts.